If you’re thinking of breeding your ferret – who is unarguably the most adorable, gorgeous ferret in the world and can only add to the genetic wonder of the species – think again. Unless you’re a trained professional breeder with deep pockets and extensive knowledge of ferret reproduction and neonatal care, attempting to breed the animal is a bad idea. The first hurdle is even finding two unaltered ferrets to breed. 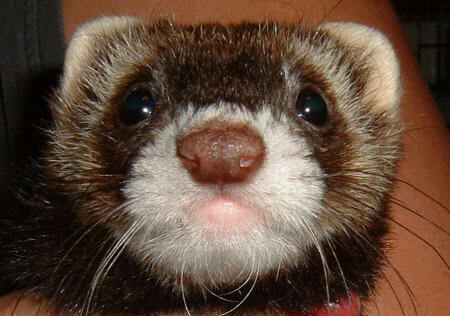 Virtually all ferrets adopted from shelters or pet stores are spayed or neutered. The only way to get a sexually intact ferret is from a private breeder, and most breeders insist buyers sign a contract agreeing to alter the animal. There are good reasons for this. Intact male ferrets become extremely aggressive when around sexually receptive females, and intact females, if not bred, maintain very high levels of estrogen that can cause death from aplastic anemia. But say you’ve lined up two potential mates. From an ethical point of view, just because they can doesn’t mean they should. Indiscriminate breeding goes against the International Federation of Ferret Breeders Code of Ethics. Breeders typically breed for specific traits, and unless this ferret union appears likely to produce top-quality babies, it is discouraged. “Only a really very small percentage of ferrets are really worthy of breeding,” Schilling says. Pregnancy typically lasts 38 to 44 days, with litters ranging between 2 and 17 kits. Pregnancy is not usually difficult, though the female – called a “jill” – will have a few special needs during this time, including increased protein requirements and a nest box awaiting her young. A variety of complications can occur just before or just after birth, however. Infections of the mammary glands or uterus are not uncommon. New mothers’ health must be watched carefully. If all this isn’t enough to discourage you from breeding your ferret, visit your local ferret shelter. Some shelters have 100 or more animals in need of a home. Bringing more ferrets – especially ferrets of unproven bloodlines – into the world is rarely a wise and responsible course of action.